Purpose: To see how small of a robotic platform I could make. Size: 1.45" long x 1.2" wide x 1.6" high. Power Source: One 0.3ampHour NiCad cell. Construction: The drive trains (one per side) were once part of a camcorder zoom lens. I soldered two of these back-to-back, soldering the metal motor housings to one-another. 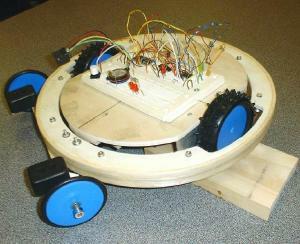 Small plastic sprockets and roller chain were added to complete the drive system. A small piece of perf-board was added to be the platform on which to mount other components. I made a small DC-DC converter using a MAXIM integrated circuit to convert the 1.2 volts of a single NiCad cell up to 5 volts (regulated). Both the PIC and the H-Bridge run off of the regulated 5 volts, providing consistent performance for the duration of the NiCad discharge cycle. 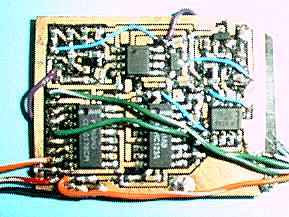 The H-Bridge was constructed from discrete 2N3904 and 2N3906 transistors. The DC-DC converter and the H-Bridge were constructed of surface mount components and assembled on a home-etched single sided printed wiring board. Operational Description: In its current prototype state, the PIC simply increments a 4 bit word every 7 seconds, and applies these 4 bits to a pair of H-Bridges (one H-Bridge and 2 bits per side), incrementing through counts 0 to 15 over the period of about 2 minutes, providing a demo/evaluation routine. 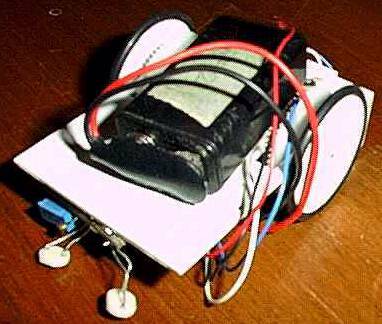 This prototype has proven to be a very good miniature robotic platform, worthy of further use and development. Future Developments/Plans: I plan to (eventually) go to a surface mount PIC, and etch a circuit board for it. I'd also like to (again, eventually) add IR emitters and IR detectors. I'm thinking that I'll make it into a desktop line follower, or maybe a desk wanderer with some sort of a cliff sensor so that it won't drive off the edge of my desk. Of course, it would be fun to make it find a re-charging station when the NiCad cell is getting low. I plan to add a small beeper and some visible LED's so it can communicate its status to me. Maybe I should add some bump sensors on the front and back too. Status: It took me a year to get this far, and continues to be a back-burner project. Many ideas and interests, very little time. Purpose: To make my first robot. Controller: Analog: a single Op-Amp. Size: 3" long x 2.5" wide x 1.7" high. 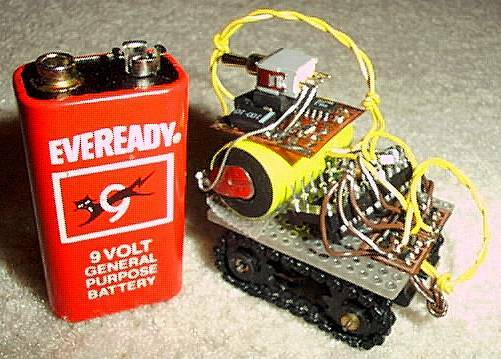 Power Source: One 9 volt battery. Construction: The whole structure was built from polystyrene sheet stock. The circuit was simple and built up on a small piece of perf-board. The drive trains (one per side) were once part of a camcorder zoom lens. These were further geared down to drive the relatively large drive wheels. The wheels were turned from polystyrene sheet stock on my drill (poor man's lathe). O-rings were added as tires for traction. Operational Description: It follows lines quite well when the sensors are properly adjusted. When both sensors have equal amounts of light, then both wheels are driven with equal voltages. When the right sensor gets more light than the left sensor (as when the right sensor is over white paper and the left sensor is over a black line) then the right wheel gets more voltage than the left wheel, and vice-versa. This action keeps the robot from wandering off the line, keeping one sensor on either side of the line. It can even acquire a line and follow a line once a line is found. Depending on the line-width and the spacing of the sensors, the robot sometimes sweeps the sensors back and forth as it proceeds forward. Future Developments/Plans: I learned a lot, mostly about mechanical construction and the difficulties of detecting a line in a real-world environment. I do not plan to evolve this platform any further. It will be the first (retired) entry into my robot museum. Status: My goal was to build a line follower that could follow a line drawn on an 8.5" x 11" sheet of paper. It works! My first robot! Now what should I make? Purpose: To make an indoor slow flying platform. Weight: 4.5 ounce flight weight. Speed: Flies from a walking speed to a quick jogging speed. Operational Description: It flies amazingly slowly... so slow that it must be flown indoors or on very calm days (read no perceptible wind). It has an electronic speed controller that allows proportional control of the propeller speed, and a V-tail, that functions as the rudder and elevator (mixing is done in the transmitter). It can take off from the ground or be hand launched. It can be landed gently on the ground or into my hand. It maintains level flight at half throttle, and can fly for about 5 minutes per charged battery. Future Developments/Plans: Fly it as often as I can. I'd like to add a video camera and transmitter just for the fun of it. Maybe some day I'll work on an IR control system for it. Status: It flies very well in calm weather and indoors. I like it as it is... it is done! 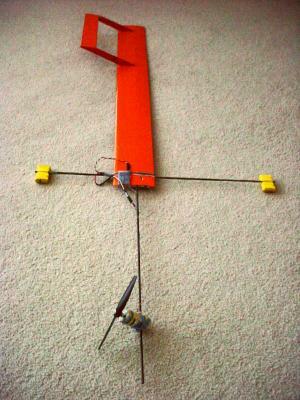 Purpose: To make a very light weight receiver for my slow flying airplane. Construction: The circuit was plotted on thin circuit board material (probably intended for flex circuits) with an UltraFine Point Sharpie, then etched using normal techniques. A "double sided" circuit was produced by putting two single sided boards back-to-back. Surface mount components were used to eliminate the need for through-holes and to minimize weight (and size). A few "blue wires" were designed-in to minimize the layout area required (thus minimizing the weight). The power, servo and antenna wires are soldered directly to the circuit board. Operational Description: It has a sensitivity of about 3uV, and a RF bandwidth of about 75kHz. With my R/C transmitter, it has a range of about 1000', although I have never attempted to fly my slow-fly aircraft at that range (it takes a long time to fly that far!). At least 5 channels work, and judging from the O'scope traces, I believe that all 8 channels would work if I had a transmitter that could exercise them. Its light weight allows my remotely controlled airplane to fly very slowly. Future Developments/Plans: Maybe make an AM version. Maybe replace two 16 pin ICs with a small 8 pin PIC. Maybe make an infrared version. Status: It is wired into my airplane and just keeps on working (once I found/repaired the cold solder joint that was making it behave erratically)! Type: Solar Roller with charge/discharge control. Purpose: To make a platform powered by office lighting. Size: 6" long x 2.5" wide x 1.5" high. Power Source: Office lighting and/or solar flux and one flux converter (solar cell). Speed: About 1 inch per minute indoors (office lighting), 1 foot per second outdoors. Construction: The simple structure was built from polystyrene scraps. The small circuit was built up on a small piece of perf-board. The drive train was once part of a camcorder zoom lens. The wheel was turned from polystyrene sheet stock on my drill (poor man's lathe). An O-ring was added as a tire for traction. The solar cell is held in place with putty. The front wheels are bearings that I salvaged out of an old VCR. Operational Description: In office lighting it jerks forward about 1/8 of an inch, about once every 10 seconds. When sitting on my desk with direct sunlight coming through the window, it zips along continuously at about foot each second. When indoors, the solar cell uses the available light to charge up a capacitor until it reaches a preset voltage (about the peak voltage that can be produced by the solar cell), then the capacitor is discharged through the motor until the voltage on the capacitor drops to a preset value (which is just below the voltage needed to run the motor). Even in dim lighting it eventually stores up enough energy to lunge forward a full 1/8 inch, but with long recharge periods between each lunge. Future Developments/Plans: Just play with it now and again. Status: My goal was to make a desktop "solar roller" that would work in office lighting... it works! Purpose: To investigate a variety of simple leg geometrys and gaits. Size: 6" long x 6" wide x 5" high. Power Source: 4 AA batteries. Speed: about 2 inches per second. 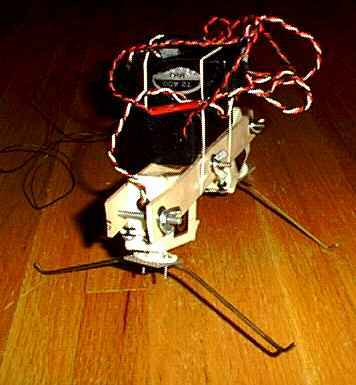 Construction: The legs were made from a stiff coat hanger and attached to the servo output shafts. The frame is two strips of wood connected with 3 bolts with wing nuts. The 2 servos are sandwiched between the 2 pieces of wood and held in place by tightening the wing nuts. The battery pack and the R/C receiver are simply attached with rubber bands. This construction allows for quick and easy changes to the walking geometry: the legs can be easily reshaped by bending the wire legs, and the angle and spacing of the servos is easily adjusted by loosening the wing nuts and reorienting the servos. Operational Description: It walks! I am surprised how insect-like it looks as it walks. In the configuration shown, it can walk forward and backward equally well. I have discovered gaits that allow it to turn with any desired radius including turning "on a dime". It can climb over obstacles about an inch high. The position of the legs is controlled with the joysticks on my R/C transmitter, so, to make it walk at a reasonable speed I have to be quick with the joystick controls. Future Developments/Plans: Maybe someday I'll make it a useful robotic platform by programming the gaits into a PIC and adding some sort of sensor(s). Purpose: To test a differential drive platform w/o a conventional caster wheel, and to have a platform that could roam about my house with 1" obstacle clearance. Speed: About a foot per second. Construction: The main body and the gimbal rings were made of plywood and hoops built up of thin wood laminations to form strong round structures. The tires are from an R/C car, with wheels made from some plastic discs made on Alan's lath during RSOH. It was done like this.The motors had attached gear reduction, resulting in a reasonable torque and speed. Operational Description: The goal was to have a mobile platform with a differential drive that didn't have a typical caster wheel. What I ended up with was essentially a gimbal configuration. This allows the inner disc to turn and pivot within the outer ring. The dual caster wheels are attached to the outer most ring. The caster wheels are spaced widely enough to provide good stability even when the main drive wheels are turned 90 degrees to the caster wheels. The inner disc can rotate and pivot within the outer ring, allowing all four wheels to remain on the ground even when the surface is uneven. Future Developments/Plans: I'd like to add a bumper around the circumference so that it could detect when it has run into an obstacle. I'd also like to add a more powerful processor so that it could roam about in a more intelligent manner. And, it'd be fun to add a video camera and a transmitter so that I could see where is going, from its perspective! Status: Right now it just does some preprogrammed maneuvers to demonstrate its maneuvering capabilities. More Info: See the January meeting photos. E-mail me! Purpose: I did this just because it seemed like a fun and interesting challenge. Batteries: 8 x N-270AA Sanyo NiCads, 2 packs of 4 cells. 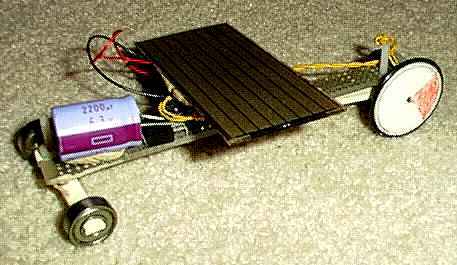 R/C Receiver: Ultra-light receiver that I designed and built for an earlier aircraft. Operational Description: To launch this aircraft, a hole at its center of mass (balancing point) is placed on a short launch peg. The spinning propeller causes the wing to spin around on the launch peg. Once it is spinning fast enough, it generates enough lift to take off vertically, like a maple seed flying upward , continuing to spin about its center of mass. The motor speed is controlled with an R/C radio system, allowing vertical control of the aircraft. The battery packs on the battery boom help provide stability (I think). Future Developments/Plans: I�d like to be able to control the direction of flight. Right now I can control only its vertical height by varying the motor speed with the R/C system. I am working on a magnetic heading control system that will use the earth�s magnetic field as a directional reference. I am writing code for a PIC controller to mix X (Left/Right), Y (forward/backward), Z (motor speed), and magnetic heading to control the motor speed. X, Y and Z will be R/C input signals, and the magnetic heading will be sensed by an onboard sensor that spins along with the wing. My goal is to eventually be able to fly this around in a very small space. I also plan to tweak the configuration to get longer flights. The things that I plan to adjust/modify include the small stabilizer wing, the shape of the airfoil, the propeller pitch and diameter, and the length of the boom that holds the battery packs. Status: It flies! Flight time is short because of limited battery life. But at least it works. I believe that this is the first successful electric monocopter. Its first flight was on New Years Day of 2002. I think it is fun to watch it fly because it is so unusual! More Info: See the January meeting photos. 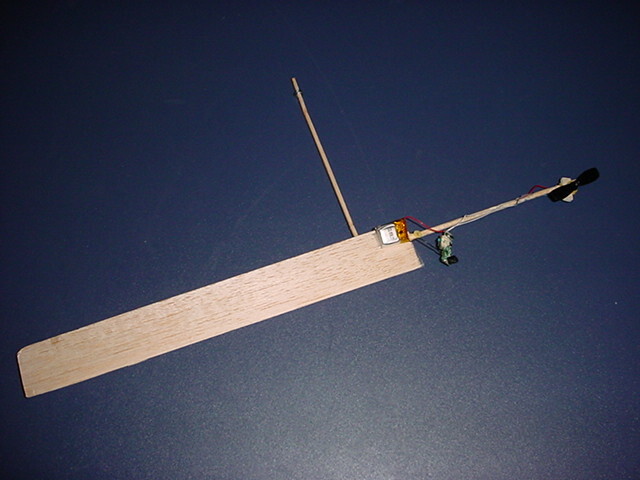 See the Articles section for info on the R/C receiver that I designed and used for this project. You can E-mail me!. Purpose: I wanted to build a small R/C monocopter that I could experiment with indoors� my Electric Maple Seed monocopter is to big to play with in my basement. Operational Description: To launch this aircraft, simply place it on a level smooth surface. 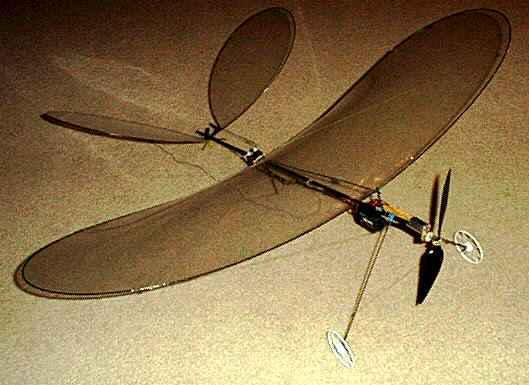 The weight of the monocopter is largely supported by a small nub placed below the wing at the center of mass. The spinning propeller causes the wing to spin around on the nub. Once it is spinning fast enough, it generates enough lift to take off vertically, like a maple seed flying upward, continuing to spin about its center of mass. The motor speed is controlled with an infrared R/C system, allowing vertical control of the aircraft. Future Developments/Plans: I�d like to be able to control the direction of flight. Right now I can only control its vertical height by varying the motor speed with the R/C system. My goal is to eventually be able to fly this around in a very small space. Sometimes the flights become unstable and the monocopter spirals out of control. I�d like to develop a better understanding of this and evolve a design that has better inherent stability. Status: It flies! I believe that this is the smallest R/C electric monocopter that has ever been flown. Its first successful flights were on about February 1, 2008. More Info: See the flight video. Once I improve the flight stability I would like to make construction plans available. You can E-mail me!.